Matt Light didn’t hesitate to jump off his bike and pitch in when he saw a Winona Lake Police Department officer in need of help. For his efforts, the Winona Lake Town Council and the police department presented a certificate of merit to the Winona Lake resident. WLPD officer Riley Arvanitis was on patrol March 16 when he pulled over a vehicle for speeding. Video of the incident was shown during the town council meeting. When Arvanitis ran a check on the driver’s license, it turned out there was a warrant out for his arrest. He asked the driver to get out the of the car and instituted a search. The officer noticed a bulge in the driver’s pocket. It was at this point the driver decided to run. The officer bear-hugged the driver and wrestled him to the ground. He said he was struggling to get both of the driver’s arms behind his back to handcuff him. That’s when Light jumped off his bike, asking, “Do you need help?” Light then helped Arvanitis gain control of both the suspects arms. 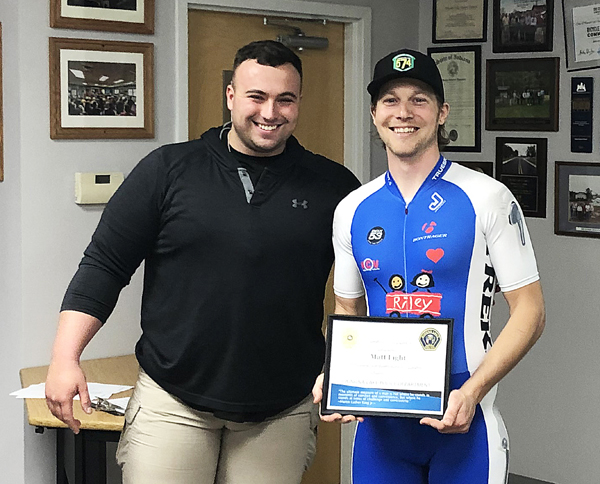 “Without any hesitation whatsoever, he hopped off his bike and helped me get (the driver’s) left arm under control,” Arvanitis said.